Once the holiday season starts, the Christmas trees are in high demand again, and people are shopping for gifts. Now you wonder, is this also the best time to get a new carpet? When you’re past the point of damage repair, do you know what to do? Do You Need a New Carpet This Christmas? Because people are busy picking up gifts and looking for the best holiday decorations, carpet companies know that it’s off-season for their products. And it’s actually great for you when people don’t pay much attention to carpets because that only means it is a great time for you to buy a new one! 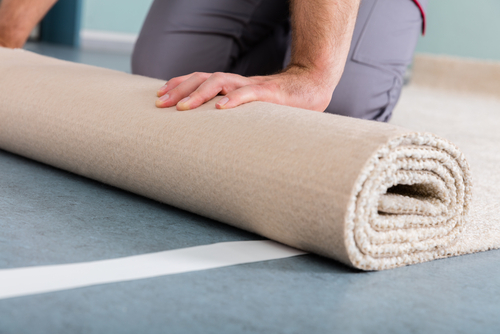 Once your carpet starts to matt, there’s not much that you can do to save it. Older carpet that experiences heavy foot traffic is impossible to be restored. So get a new carpet and make sure it can withstand the traffic. If you have more than a couple of stains on your carpet and just keep on hiding them by using rugs and furniture, give yourself and your home a gift this Christmas by getting a new carpet! Dirt buildup and debris that are hard to remove can cause bacteria to grow underneath your carpet. And once mold develops, it will just keep on infesting your carpet even cause you more serious problems. Carpet padding is a layer that makes carpet comfortable to sit on. It also buffers noise and insulates the floor. So if your carpet has wrinkles and makes sounds when you walk on it, consider replacing it already. Either from mold or pet excretions, foul odors can be harmful to your health. If deep cleaning doesn’t solve the problem, just get a new carpet. Getting a new carpet will not only do favors for your guests this Christmas season but also to yourself. Take advantage of this perfect opportunity if your carpet is already showing signs of giving up!